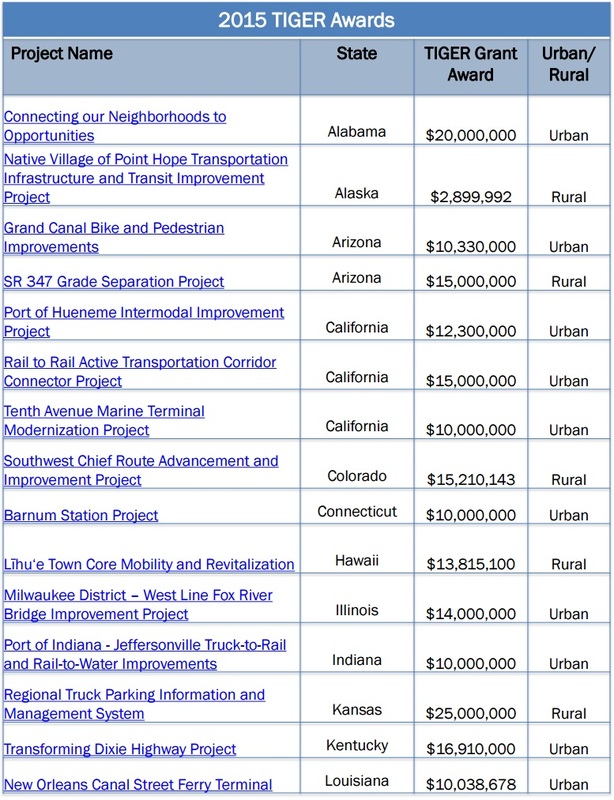 WASHINGTON – U.S. Transportation Secretary Anthony Foxx today announced that the Department of Transportation will provide $500 million for 39 transportation projects in 34 states, some projects spanning several states, from its TIGER (Transportation Investment Generating Economic Recovery) 2015 program. This year rural areas received 43% of the project awards, a higher percentage than any previous year. The Department received 627 eligible applications from 50 states and several U.S. territories, including Tribal governments, requesting 20 times the $500 million available for the program, or $10.1 billion for needed transportation projects. A $10 million grant to develop complete streets and a linear park trail in Kalispell, Montana that will catalyze redevelopment in the heart of the community by relocating rail serving the neighboring industrial park and removing rail from the downtown area. A $2.9 million grant to assist in the construction of critical roads and sidewalks in the Native Village of Point Hope, Alaska, and the purchase of ADA-compliant transit buses to provide accessible transportation throughout the community. A $20 million grant to develop a new 15-mile bus rapid transit (BRT) line in Birmingham, Alabama, connecting Birmingham’s residents, especially low-income citizens, to employment centers, educational opportunities, and community services. A $15 million grant to more than double the existing streetcar system in Tacoma, Washington, better connecting the downtown to major employment, medical, education, and other institutions. A $20.8 million grant to construct transit facilities in growing rural areas of Texas, and to buy replacement transit vehicles that will provide service to rural areas, and that will have improved safety and accessibility features for persons with disabilities. A $15 million grant to construct a grade separated highway overpass at the intersection of State Route 347 and a double track rail line in Maricopa, Arizona, fostering a safe, connected, accessible transportation system for the multimodal movement of people, goods, and services. A $1 million grant to help complete a bike and pedestrian network in the Pueblo of Laguna, New Mexico, creating safe bicycle and pedestrian access linking economic centers to residential areas, and serving as the catalyst to the revitalization of the traditional village areas of the Pueblo of Laguna. A $16 million grant for improvements to support the accelerated replacement of the century-old Portal Bridge that crosses the Hackensack River in New Jersey, which will improve aging infrastructure and ultimately facilitate faster, safer, and more reliable rail traffic on one of the most congested segements of the Northeast Corridor. A $16.9 million grant to convert Dixie Highway in Louisville, Kentucky to a BRT corridor to better connect the southwest part of the city to jobs, social services, education, and medical care along the corridor, including safer options for bicyclists and pedestrians. A $25 million grant to implement a regional truck parking information management system along interstates in Kansas, Kentucky, Indiana, Iowa, Michigan, Minnesota, Ohio, and Wisconsin, providing truck drivers with reliable, real-time information to make smarter, more efficient truck parking decisions. A $9 million grant to assist in the construction of a multimodal travel plaza on I-95 in Hopkinton, Rhode Island, that will include electric vehicle charging stations, a secured bicycle parking area and a newly constructed welcome center with incorporated solar panels. A $6.8 million grant to assist in the development and deployment of technology for fixed and demand-response transit operators in rural transit service areas across rural Ohio. This is the seventh TIGER round since 2009, bringing the total grant amount to $4.6 billion provided to 381 projects in all 50 states, the District of Columbia and Puerto Rico, including 134 projects to support rural and tribal communities. Demand for the program has been overwhelming, to date the Department of Transportation has received more than 6,700 applications requesting more than $134 billion for transportation projects across the country. 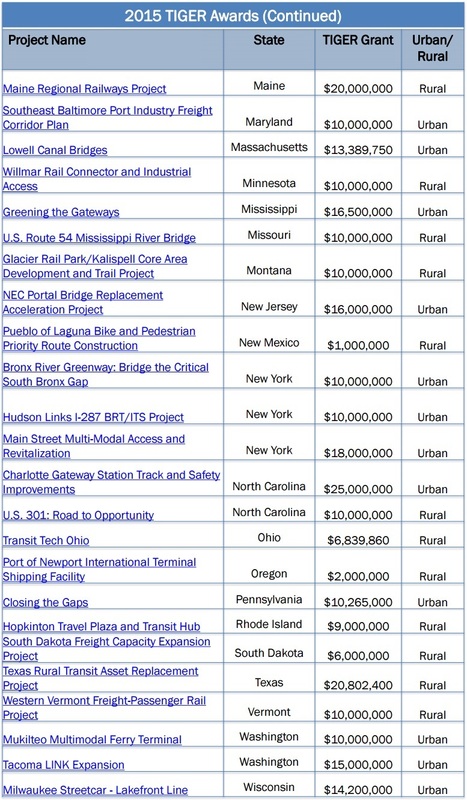 The GROW AMERICA Act, the Administration’s surface transportation legislative proposal, would keep TIGER roaring with $7.5 billion over six years for TIGER grants.